We are all getting in a festive mood now; it’s time for a well-deserved break. I know some of you are as bad as me and will already be planning the new year ahead and especially the Dynamics events you want to attend in the next few months. This is the go-to event for everyone in the Dynamics community! This is a Microsoft ran event aimed at Dynamics end-users from all over the world. Freelancers and partners are welcome as well. This is an annual conference and Microsoft fly in many key execs from Redmond as well as many other global offices. It is a great opportunity to network with Microsoft, other end-users and partners, as well as learn about the product-centric view of the latest releases, the top strategies and the road ahead for the key Microsoft solutions. There are multiple product specific tracks and product sessions. The keynote speakers are Satya and Kirill. For the more technical audience, this is a great opportunity to learn directly from the R&D teams for both Microsoft Dynamics AX and Microsoft Dynamics CRM. Enjoy the keynote, the hands-on labs and deep dive sessions, as well as getting a great look at Microsoft’s home town. It is suitable for both experienced consultants as well as newcomers. The Technical Conference allows you to interact directly with the people that build Microsoft Dynamics AX and Microsoft Dynamics CRM, find out about the road map and latest features. 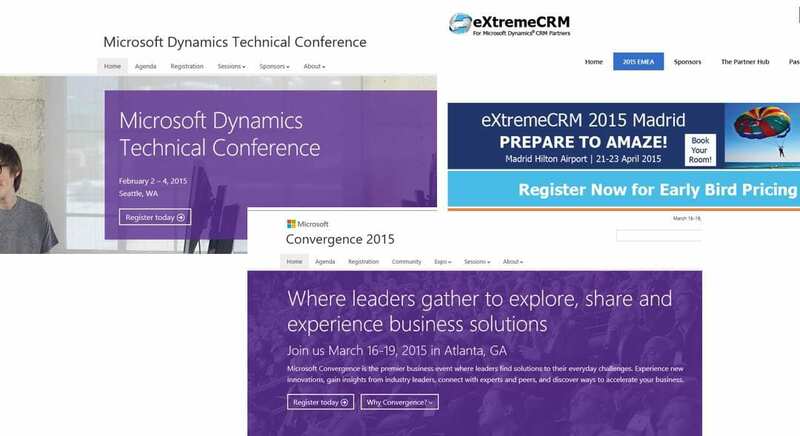 eXtremeCRM is 100% focused on Microsoft Dynamics CRM with tracks for each role within your organisation. The conference is independently run by eXtreme, who deliver community-based events and activities. Microsoft Dynamics CRM partners come together to network, gain knowledge from real-world experiences, and dive deep into current and future technologies. There are different tracks for Product Development, Marketing, Sales, Consultants, Sales Engineers, Developers and Training Academy, In addition, there is an Exec Summit & Exec Exchange for the senior managers. Pricing: €795-€1,295 depending on how early you register and which track you attend. Don’t miss the Early Bird registration so this might be something to do before you go away for the holiday. If you find this article useful, please share it with other colleagues of yours. The more people attend these events, the better the networking experience. Also, if I missed any other key events, please shout out!